Christopher Andrew Sabo was born in Detroit, Michigan on Jan. 19, 1962. He played for the Shamrocks of Detroit Catholic Central High School, and was originally drafted in the 30th round by the Montreal Expos in the 1980 amateur draft, but opted no to sign. He went on to play third base for the University of Michigan, alongside other future Reds teammates Barry Larkin, and Hal Morris. Sabo was drafted by the Cincinnati Reds in the 2nd round of the 1983 amateur draft, the same year the Wolverines went on to win the College World Series Championship. 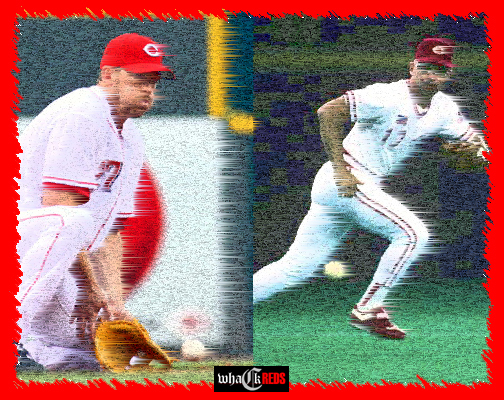 From '83 to '87 Sabo climbed the minor league ranks in the Reds farm system, and by the 1988 season Buddy Bell was sidelined and the Reds were in need of a third baseman. Sabo was electric in his rookie season hitting .271, with 40 doubles and 46 stolen bases. He was voted to the All-Star game and walked away with the Rookie of the Year Award (only the 7th Red to ever do so). During this rookie season Pete Rose nicknamed the third baseman "Spuds MacKenzie" citing a resemblance to the Bud Light bull terrier party animal. It was later revealed that Spuds' real name was Honey Tree Evil Eye, and the "he" was actually a "she". Nicknames aside, Sabo had an average '89 season playing in only 82 games, but had become a fan favorite and was set to be the everyday man at third rolling into the 1990 season. Chris led the club in home runs, doubles and runs scored throughout 1990, again becoming an All-Star and becoming an anchor for the dynamic Reds team. His two-run homer in Game 4 of the NLCS helped the Reds defeat the Pittsburgh Pirates. He hit .563 during the World Series including a homer and three RBI during Game 3 versus the Oakland A's. Sabo parlayed his success into the 1991 season having a monster year. He put up career-highs in batting average (.301), home runs (26), RBI (88), hits (175) and games played (153), again making the All-Star team for the third time in four years. By '92 Chris was plagued by injuries playing in only 96 games. 1993 was an up and down year, hitting 33 doubles and 82 RBI, but striking out 105 times and collecting only 6 stolen bases. On October 25, 1993 Spuds was granted free agency. He went on to play for the Orioles, White Sox and Cardinals throughout the '94 and '95 seasons, finally landing back in Cincinnati to close out his career in 1996. Sabo was constantly switching up his bats and was known to rummage in an old storage room under Riverfront Stadium where there were heaps of old bats. If he found one he liked he would use it come game-time. During a game in '96 his bat was shattered revealing it to be corked. He maintained that he didn't know it was corked and that the bat was not his. After being suspended for seven games Sabo was quoted as saying his numbers that year were not exactly "an endorsement of the cork industry." For his career, Sabo ranks in the club's top 25 in home runs and doubles. Sabo ranks among the club's top 50 in games played, at bats, hits, RBI, runs scored, stolen bases, walks, slugging percentage and total bases. Known for his trademark flat-top haircut, Rec-Specs goggles and his down to earth demeanor he is a bona-fide legend in Cincinnati sports. Sabo was selected as an inductee into the Reds Hall of Fame class of 2010 alongside Bill Werber (Class of 1961) and Heinie Groh (Class of 1963) as the only third basemen inducted into the Reds Hall. The trio will be inducted during on-field ceremonies in the Hall of Fame Game July 17th, 2010 at Great American Ballpark. Scott Bruce Rolen was born on April 4, 1975 in Evansville, Indiana. As is the case with many natural athletes Scott was a multi-sport threat playing basketball and baseball throughout his formative years. By his senior year in high school he was strongly considering a basketball scholarship with the Alabama Crimson Tide after coming in third for the "Mr. Basketball" voting, which is no small feat in the state of Indiana. By the time the baseball season rolled around, Scott was a utility type of player who was capable of playing all over the diamond, as well as being the Wildcats strongest relief arm. He was chosen to play third base that year, where he dominated being voted "Mr. Baseball" becoming the top athletic prospect in the state. He was drafted in the second round of the 1993 amateur draft by the Philadelphia Phillies. Rolen began his career at Martinsville in the Appalachian League batting .313 in 25 games, and by 94' he was considered the organizations top prospect playing for Class-A Spartanburg. By the time the 96' season had gotten under way he had been moved up to triple-a playing for Scranton-Wilkes Barre after hitting .361 in 61 games for Reading. At the All-Star break of that season the Phillies bumped Todd Zeile out of the hot corner and Rolen became the everyday third baseman. In early September he was hit by a pitch that broke his arm and left him with only 130 at-bats, keeping him eligible for Rookie of the Year in the '97 season. He finished with a .283 average, 21 home runs, 92 RBI, 93 runs scored and 16 steals during the 97' campaign. Rolen was the Phillies top offensive and defensive player, as well as becoming a team leader in the clubhouse. He was the unanimous choice for Rookie of the Year beating out Livan Hernandez, Vladimir Guerrero & Andruw Jones. In '98 he signed a four year contract extension for a cool ten million and went on to win his first of seven gold gloves. He is currently third all time in gold gloves at the hot corner behind only Brooks Robinson (16) and Mike Schmidt (10). Comparisons to Schmidt were commonplace in the city of brotherly love, and Rolen was now an established big league threat. He moved to his right better than most shortstops and earned the reputation as a tough, gritty performer. The next few seasons the Phillies were rebuilding and began sculpting the team into a winning franchise going into the turn of the century. The end of his career in Philadelpia had ups and downs including disputes with manager Larry Bowa, nagging injuries, and constant trade rumors. During the winter of '01 Rolen turned down a $90 million contract to the shock of the organization. He started the '02 season on fire and was traded after 100 games to the St. Louis Cardinals. Rolen started off slow with the Cards, but rebounded down the stretch ending the season with 14 homers and 44 RBI in 55 games, helping the team to the Central Division title with a 97-65 record. He had a solid '03 season winning his 5th gold glove. His 2004 season was his best major league season putting up career highs by hitting .314 with 34 HR and 124 RBI. The Cards easily won the NL Central finishing with the best record in baseball at 105-57, with a little help from guys like Albert Pujols and Walt Jocketty. He made the All-Star team from '02 to '06 , and won his seventh Gold Glove in '06. The Cardinals had continued success as Scott battled injuries on the DL in '05 and '07, while still remaining a vital tool to the teams overall productivity. St. Louis won their tenth World Series Championship in 2006, and Rolen had his first ring as a big leaguer. Things got messy in '07 when Rolen's shoulder injury placed him on the DL, eventually leading to season ending surgery. The team had a losing record, and his soured relationship with Tony LaRussa over over playing time began to ferment. In '08, the Cards reached a preliminary deal to send Rolen to the Toronto Blue Jays for Troy Glaus. In '08 he ranked fifth among AL third baseman with a .964 fielding percentage, as well as ranking among AL leaders in several hitting categories in 09' before being acquired by the Reds. Walt Jocketty snagged Rolen from Toronto, along with cash, in exchange for Edwin Encarnacion, righty Josh Roenicke and righty Zach Stewart on July 31, 2009. By letting go of Encarnacion, Rolen has filled the role of everyday third baseman for the Redlegs. Scott combined to hit .305 with 11 HR and 67 RBI with the Blue Jays and Reds last season, and helped the Reds to a 27-13 record to finish the season after coming off the DL. If injuries aren't a nagging issue throughout the season, Rolen should provide veteran leadership, sharp defensive mechanics and a proven bat to this 2010 squad. He is currently signed to a two-year contract extension through the 2012 season.